There is a new artist I discovered on YouTube named Honey Gentry and so far I just really love her music. Her stuff reminds me of Lana's unreleased acoustic songs and has a very similar vintage aesthetic. Thought I'd share with you guys some of her songs. I LOVE Honey Gentry. My fav is Heaven, California. I've just discovered her because of this post and holy shittt she's sooo good why isn't she more famous! Her song 'Golden Heart' is now on Spotify so there is hope! This little queen has some tunes... yaas. I'm eagerly awaiting! She's saved my music-less summer Do you have any other artist recommendations for me seeing as you discovered this angel? 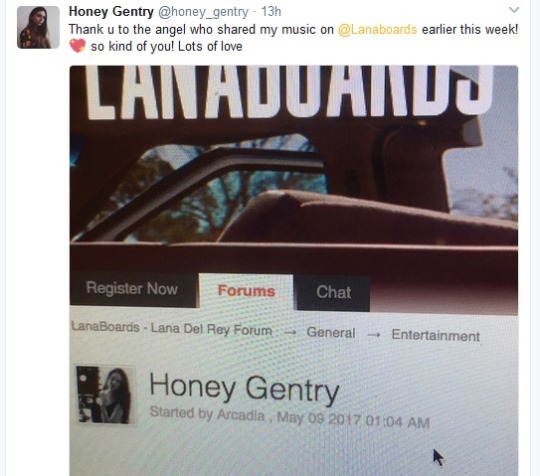 Hmm.. Honey's acoustic side reminds me a lot of Bonnie Dobson (she has an amazing voice). omg i've followed her on tumblr since forever but never listened, idk what just made me go check her out now but i'm glad i finally did!!! she's an angel!! what's all her social media @s? She covered Wicked Game recently. Its so good. exactly how id envision Lana to cover it, but Honey Gentry is honestly just flawless as it is.